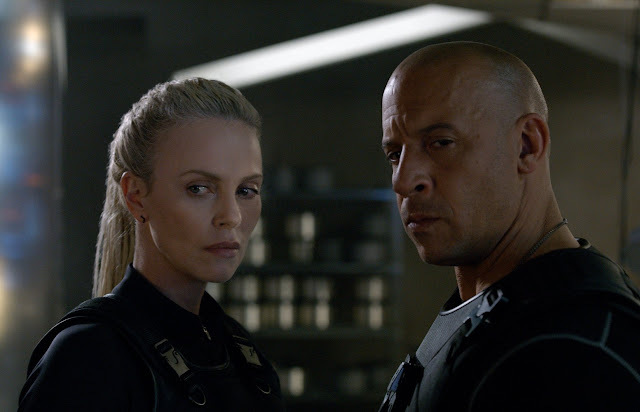 Cipher (Charlize Theron) convinces Dom Toretto (Vin Diesel) to turn against his family. From the director of Straight Outta Compton, but maybe more relevant to today's discussion, The Italian Job (2003) The Fate of the Furious comes to us courtesy of F. Gary Gray or the fifth director to take a crack at this franchise. Again scripted by Chris Morgan who has more or less been the architect of the series since Tokyo Drift we pick up with Dom and Letty (Michelle Rodriguez) in Cuba as they are finally taking their honeymoon and basking in the fact all seems to be right and calm in their world. The Fate of the Furious opens as one would hope any Fast & Furious movie would-with a street race featuring hot rod cars, scantily clad women, and a soundtrack with a bass so heavy you feel like you're actually sitting in one of the cars on the screen. And while Gray opens his film by paying homage to the origins of the series while simultaneously acknowledging how much it has grown with little more than the scale on which a simple street race is captured we quickly move past the fun and games and into something a little more sinister. On the streets of Cuba Dom encounters a more fair-skinned individual than is common in such parts of the worlds who, unbeknownst to Toretto at the time, is known as Cipher (Charlize Theron) or one of the world's elite shadow hackers. Cipher convinces Toretto to assist her in her evil plan by holding something that must be severely damning over his head as our protagonist hardly flinches when Cipher states her demands. Right about this same time Dwayne "The Rock" Johnson's Luke Hobbs is recruited to perform an off the books mission that asks him to chase down one of many McGuffin's in this movie that has him recruit Toretto and his team; this inadvertently setting up the perfect time for Dom to start his services for Cipher. After double-crossing Hobbs and bewildering the rest of his "family" that includes Roman (Tyrese Gibson), Tej (Chris "Ludacris" Bridges), and Ramsey (Nathalie Emmanuel) Dom essentially leaves Hobbs to take the fall for their unsanctioned action sending him to the same prison that not only holds countless baddies he helped put away, but also Deckard Shaw himself. Mr. Nobody (Kurt Russell) shows up with a bright-eyed and bushy-tailed Little Nobody (Scott Eastwood) to lend Hobbs a hand with the ulterior objective of recruiting both Hobbs, Shaw, and Toretto's team to not only figure out why Dom has gone rogue, but to also end whatever game Cipher intends on playing. What has been consistently surprising to me since the fourth film in the series is just how well Morgan and Universal have structured the world-building of this franchise and how well they have planned out the next steps in the story with each film progressively building atop everything that occurred in the previous film. This is a series where, as an audience member, one needs to have seen the previous films in order to understand what all is going on and who exactly everyone is to fully appreciate the breadth of the saga and the depth of the details. This is not to be undervalued in a world where not long ago sequels didn't care as much about continuity, but since the structuring of these films around the events of Tokyo Drift and beyond it has become clear just how vital the mythology that each piece adds to the bigger picture is and what it could ultimately mean further down the road. The Fate of the Furious is no different and dammit if I'm not still sucked into the melodramatic, cornball, serial nature of the whole thing. In this regard, what this newest chapter does to not only build on the past, but towards the future is to give a slightly darker shade to the lengths Dom is willing to go to in order to keep his family together. For the sake of doing something different with the character though, unfortunately the film as a whole spends too much time on this turn of events to the point it doesn't take the time to relish in and take advantage of everything else it has to offer. Case in point: Theron as the villain. While the Fast & Furious purist in me has a fair amount of trouble believing the likes of Roman, Tej, and especially Letty would have as easy a time as they seemingly do letting Shaw into their gang as an ally rather than an adversary given he killed one of their best friends and actively hunted down many of them the combination of friction and comic relief the script lends Shaw and Hobbs' interactions is almost enough to make me forget such details. The point is-Shaw was and is a solid, unforgiving, yet charming antagonist that was a formidable threat because he very much thought the same way as many a member of Toretto's gang. With Theron you have an actress who could do any number of things with a role like this, but rather than give her the room to explore as much she is cooped up on an airplane (fast and) furiously punching at a keyboard so as to hack faster than everyone else around her. 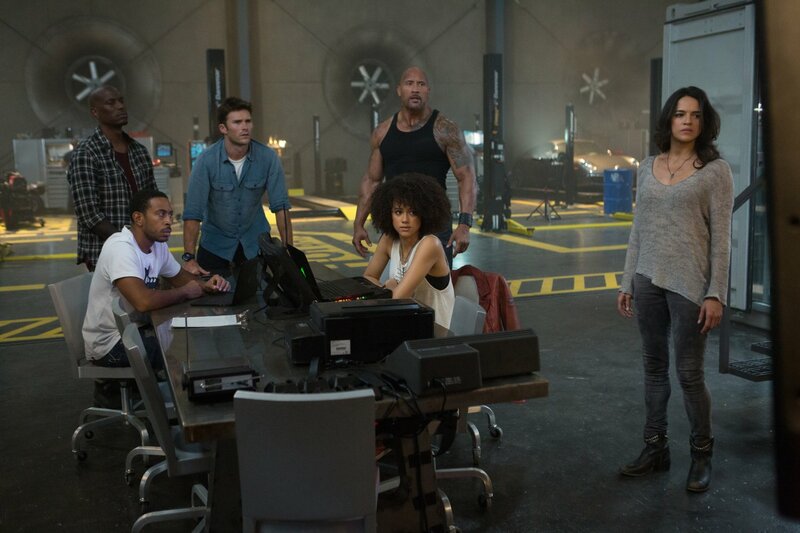 From left: Tyrese, Ludacris, Scott Eastwood, Dwayne Johnson, Nathalie Emmanuel, and Michelle Rodriguez star in The Fate of the Furious. The same could very well be said about Helen Mirren's sweet but all too brief appearance in the film and even to that of Russell's Mr. Nobody who was a highlight of the previous picture, but is largely relegated to a conveyor of exposition here. I also couldn't help but feel a little awkward at how obvious Eastwood's character, while a completely different personality, seemed to be filling in for the absent Brian O'Conner. Maybe most unfortunate is the fact we can really feel that weight of that missing relationship at the heart of the film. Straining the film even-as if Morgan and the producers were unsure what to do with the rest of the characters without that element of Brian there to integrate and play off of. 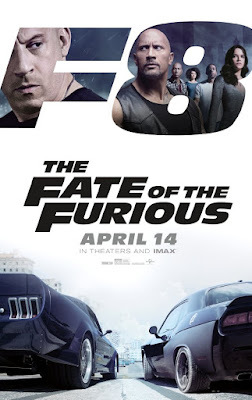 That said, whereas The Fate of the Furious tries to have its cake and eat it too in regards to darkening the tone while keeping the focus largely on the team component rather than allowing such darker caveats an actual chance to breathe Gray and his film still offer some of the more breathtaking action set pieces and some of the best, pure action visuals that we've seen in some time. For starters, the opening street race is a welcome return to the roots of the series, but watching a similar sequence in the 2001 original as compared to what we have here is like night and day. It's the spirit that counts though, and Gray nails that in this critical sequence that sets the tone for the rest of his film. From that point on there are at least three other action sequences that are genuinely thrilling to witness on the big screen (and more specifically, the IMAX if you have the opportunity). From a prison break sequence that has Statham's Shaw going head to head with Johnson's Hobbs with Shaw demonstrating a penchant for parkour and Hobbs using the brute force of his body to a legit ginormous set piece in the middle section of the film when we're taken to Manhattan that has Theron's Cipher taking over countless cars and auto-piloting them to a target she's after-the scale is breathtaking, the execution is clean, and the impression it leaves is unmistakable. And that's all without even going into Statham's hand to hand combat aboard a plane or the rest of the crew's ice excursions in Russia that include a nuclear submarine. The Fate of the Furious goes big in more ways than one and some of it works while some of it doesn't. It was bound to happen when things become this bloated, but Gray, his seasoned cast, and Morgan still have enough of a hold on their material to ensure that, if nothing else, this Fast is still fun enough despite itself.